Chelsea defender Antonio Rudiger says he does not agree with manager Maurizio Sarri after he recently suggested a lack of motivation was the team’s problem. The Blues have suffered some bad recent results, losing 2-0 away to Arsenal and 4-0 away to Bournemouth, with Sarri not improving this group of players as much as would have been hoped when he took over from Antonio Conte in the summer. This led to Sarri slamming his players as hard to motivate recently, though Rudiger does not believe that’s an issue with this squad, pointing to some big results they’ve achieved this season and suggesting that the Italian tactician is being ’emotional’. 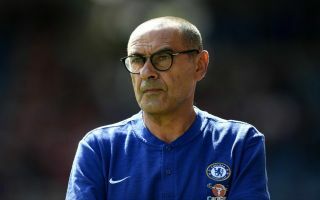 The Germany international suggests instead that CFC are still adapting after years of playing a quite defensive style, with Sarri bringing in a more attack-minded and possession-based game since he took over at Stamford Bridge in the summer. Rudiger believes this is normal, and pointed out that Pep Guardiola encountered similar problems in his first season at Manchester City. “For a long time, Chelsea had a defensive approach. And you can’t get used to something new overnight. Pep Guardiola’s first year wasn’t all that smooth as well,” Rudiger told Kicker. “He (Sarri) is a very emotional coach, but you can’t put everything down to motivation.